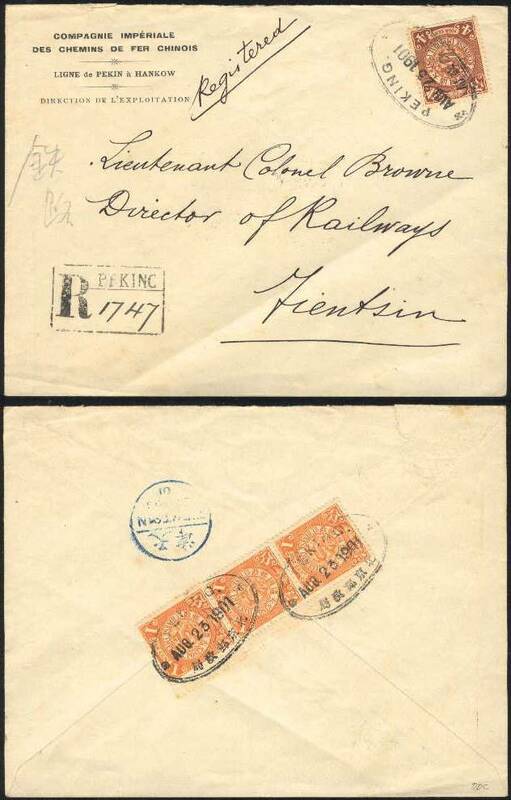 This registered cover was sent from Peking to Tientsin (now Beijing to Tianjin). Tientsin is an entry city long known as a treaty port. It is about 120 km southeast of Peking. The cover is franked with stamps from the Imperial Chinese Post issued in 1900. There is a 4 c. orange brown (oxidized?) and three 1 c. ocher (Scott 113 and 111). The sender marked the cover Registered. registry mark and adding a script serial number. There are three nice strikes of an oval western Peking datestamp. There is a purple western Tientsin receiver but I cannot read the date. Railroad Company operating a line from Peking to Hankow (now Beijing and Wuhan). Hankow is about 1050 km due south of Peking. The office is that of the Director of Exploitation (Director of Marketing?). The rail line from Peking to Hankow had been built by the Belgians. The addressee was Lieutenant Colonel C. A. R. Browne, R.E., Director of Railways, Tientsin. foreigners had taken control of many significant services. (My link to Colonel Browne has disappeared. now in the archives of the Royal Engineers. accurately portrays a domestic registration rate.